Short details for Triptyc Three: "Mary Magdalene Grail Lore"
France: Triptyc Three: "Mary Magdalene Grail Lore"
Please do not hesitate to contact us for further information concerning Triptyc Three: "Mary Magdalene Grail Lore" and/or our Tours & Studies! Triptyc Three: "Mary Magdalene Grail Lore"
Home » Journeys » Triptyc Three: "Mary Magdalene Grail Lore"
The option to Magdalene Quest: Triptyc Three remains always flexible and responding to the participant's main interests and therefore can always be re-united or added to another extra option: Triptyc Three: "Mary Magdalene Grail Lore". Introduction to "Triptyc Three: "Mary Magdalene Grail Lore""
Welcome to Caer-Sidi / Triptyc Three: the " Magdalene Grail Lore"
Should you be alone, or with your family, or with a small group of friends or spiritual practitioners, do not hesitate to contact us, we will develop a custom-made escorted tour upon your approach, agenda and request. All our options are flexible and allow you to create your own Quest itinerary, with the help of our local specialists, guides, lecturers and academics. Please take a few minutes to study the Itinerary and get an idea of the main interests have on offer. We will then assist you in putting together an journey that will serve your exact interests, requirements and approach. Concept of "Triptyc Three: "Mary Magdalene Grail Lore""
So goes the legend that, after the crucifixion of Jesus, the Nazareens were put into boats and set afloat without oars, food, or water. But this is not very credible. What may be more realistic is that they simply followed the using maritime trade routes between Israel, Alexandria and Marseille, per se. In fact, it mentions also that Pontius Pilat was their protector and that after the crucifixion of Jesus, he became commander of the Roman troops in Southern France, and accordingly assisted such people in arriving in Provence, where he awarded them land in the swamp, known as the Camargue. One needs to remember also the role played by Kind Herodus, another powerful exile from Israel, who resettled his domains in the same region. Once there, they again established the Magi schools, and the group of women known as the Mary's became famous through their use of essential oils in South France. Mary Magdalene was the carrier of a tradition of respect and reverence for the Divine Feminine, a secret initiatory tradition that leads back through Jesus, Gnosticism, the esoteric teachings of Judaism, and the Egyptian mysteries of Isis to the ultimate ground or source of all religions. Our pilgrimage will accordingly start as usual at the Cap Ferrat Black Madonna chapel, and then enfolds from the Verdon Chapels to the Ste Baume, St Maximum, Aix en Provence, St Victor, reaching therafter the Ste Marie de la Mer (Saras), then to pursue our Quest towards Narbonne, Limoux, Alet, Puivert and other sacred pilgrimages sites, which then are related to the later period of the Cathares and Knight Templars historical heritage. Our references will include a selected review of the Cathars and Knights Templars history in South of France, as well as a narration of the first century exile to South of France of Mary Magdalene, Joseph of Arimathea (James) and other apostles of Christ in Provence Septimania , then for some of them to Brittany (Armoric), then to Glastonbury and Wales. 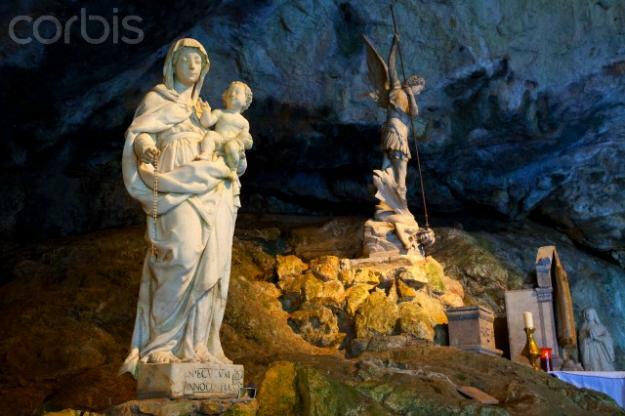 The myth of Mary Magdalene and Joseph of Arimathea (James) will be studied in places such as Rennes-le-Chateau, La Val Dieu (Center of Mary Magdalena cult), les Ste Beaume, les Saintes Maries de la Mer and the St Victor Basilica in Marseille (the ritual space at the basilica of the golden goddess, Notre Dame de la Garde and the Crypt of the Abbey of St. Victor ). While the legends of the Cathares and Templars Holy Grail took on a life of their own many centuries later, merging with other legends, many believe that Mary Magdalene was herself the earthen vessel bearing Christ's child, the sacred bloodline of David. This is said to be indeed what many early Christians, including the Cathars, believed. The Cult of the Magdalene, forced underground, is linked to the Cult of the Black Madonna, which thrived in France and elsewhere in Europe. There has been much speculation as to the origin of the Madonna's blackness. One link is to Sarah "The Black Queen," believed to be the child of Mary Magdalene, brought out of Egypt. The town of Les-Saintes-Maries-de-la-Mer, in southern France, still celebrates her festival. Other links are scriptural, such as the Bride in the Song of Songs: "I am black, but comely, O ye daughters of Jerusalem" (Song of Solomon 1:5, B,C *). A cult of St. Sara persists today at Les Saintes Maries de la Mer, one of the earliest Magdalene sites in France. From the Abbaye of Alet (Aude) to the Verdon, we will have accordingly been to most the Altars of the Magdalene, being first in Aix-en-Provence and Ste. Baume, where Mary lived in retreat and died. We will pray in the Grotto of St. Mary Magdalena and visit St. Maxim. This Pilgrimage will give us ample time to wonder and reflect on the Grail Quest Myths, as well as on the meaning of its Tantric Chivalry, Dames, Fairies and Magdalene legends found therein.